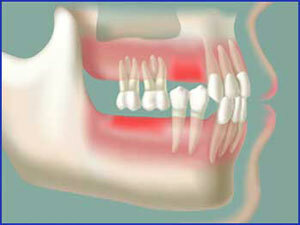 Missing teeth, among many other consequeces, can also result in chronic headaches. When teeth are missing, the opposing teeth, having no contacts, can overerupt and cause tissue damage to the gums in the edentulous area. Missing teeth also causes traumatic contact on the teeth while eating, and even when just opening the mouth. 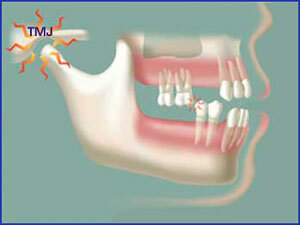 This, in turn, can cause the jaw joint – the Temporo Mandibular Joint (TMJ)- to become stressed, often causing headaches. 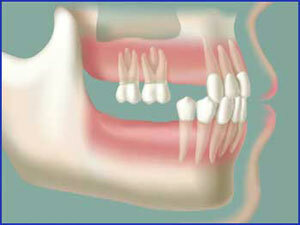 With the top premolar teeth missing, the premolars have no opposing force and continue to erupt up. Continued poor contact can cause stress to the Temporo Mandibular Joint, causing headaches. If you are missing one or more teeth and experience persistent headaches, you might be suffering from the TMJ disorder. Schedule a personal appointment with one of our highly experienced periodontists for a complete jaw evaluation. All of our periodontists have many years’ experience performing placement of dental implants, and they can determine whether receiving one or more implants might help alleviate your headache. To set up your appointment, please call us or request a consultation online.